Lee Adams of central Florida owns 14 high-end sports cars, including a Ferrari, Mosler, Ariel Atom and a Corvette ZR1. Or he used to own a ZR1, until he had to call 911 after getting locked inside. I closed the door and the door locked and would not open. The car would not start. I was trapped! I called 911 and the police came quickly thankfully. Once the officer assured himself that ilt was a car problem and not a idiot driver problem. He nor I could not figure out what to do. He called the chevy dealership. They recommended I get out of the seat and crawl to the back of the ZR1 and pull the emergency tag. It is not a pretty sight to see a fat, 65 yr old man crawling to the back of the car. Well I did and the trunk opened. That was this morning and the ZR1 is sold, gone out of my life. Took it to the dealer that helped me and sold it cold and flat. It is still in my garage I am not going near it. They will have to come to my home and get it out of my garage. Thank god for the police and the chevy dealer. Boo for GM. What a stupid system to put onto a car. Just think , if my garage door was closed not open and I did not have a cell phone and my wife just left for Vermont It could have been alot worse. No more cars for me with automatic door lock systems. FYI the officer said his captain had the same problem with his Corvette. Adams, a retired executive, owns enough vehicles that he can't drive them all regularly, and has to keep some of them on battery chargers so they don't run down — which is what happened to the ZR1. 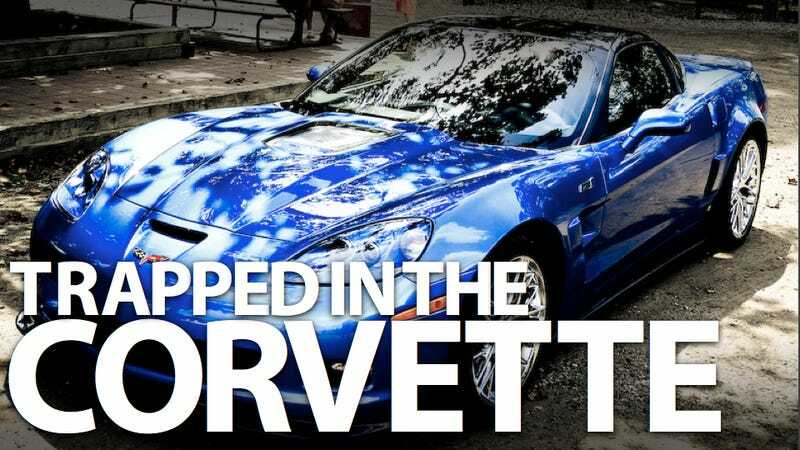 Unfortunately for him, not only was he unaware of the manual release switch for the doors located on the floor near the seats and detailed in the Corvette's owner's manual, the Chevy dealer on the phone was also unaware — despite it being a somewhat common problem for Corvette owners. According to his posts, Adams will fill his empty spot with another GM sports car — namely a high-end Camaro. And it's not as if he's unaccustomed to the quirks of collectible cars, like when your Ferrari 458 blows an oil hose and catches fire. PS: I probably should not tell the forum, that on some cars I cannot even figure out some of the "gizmos" That is okay the cars perform just as well! So it's probably best for all involved that Adams focus his attentions on vehicles with fewer hidden switches and a gently used ZR1 find a new home.